Clan MacDougall is known to trace its ancestry from both the Gael and Norse cultures, as the founder Dougall (alternately Dougal or Dugall) had immediate family members of Norse descent. 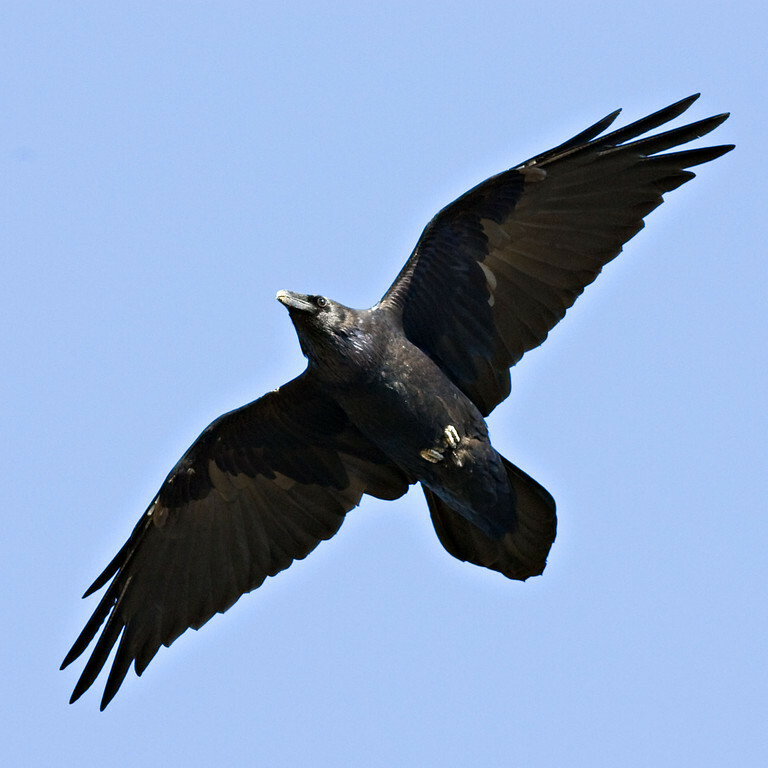 In order to strengthen these connections, it is believed that the animal symbol of the Raven was adopted, as can be seen on the Raven Flag of Lunga. Throughout history scholars have noted that instead of the traditional dragon head on the prow of their galleys, Clan MacDougall chose the raven as their representation. But what is truly known about our adopted symbol? Commonly associated with ill omen, the Raven has never been truly appreciated, except perhaps as an oddity. It is time to dispel these misconceptions, and examine the positive aspects of the Raven as a symbol of Clan MacDougall. 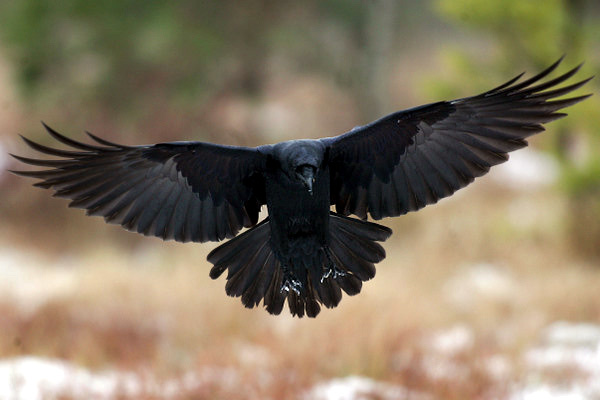 Ravens, from the family Corvidae, are a highly successful species, mainly due to their high level of intelligence, flexibility and adaptability. 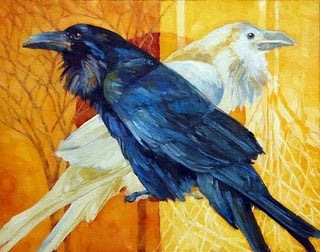 In The Audubon Society Encyclopedia of North American Birds, ornithologist John Terres writes that “Corvids have probably achieved the highest degree of intelligence to be found in any birds.” Animal behaviourist Konrad Lorenz agrees, writing that the raven has the “highest mental development” among the avian species. Naturalist Tony Angel has proven in controlled laboratory experiments that ravens are “superior in intelligence to all other avian species tested.” Irene Pepperberg, of the University of Arizona, has gone even further, stating that corvids share “the cognitive capacities of many primates.” While this may be a small sample, it does indicate that ravens have the ability to overcome obstacles using their innate intelligence, which is a quality that we as humans continually portray in our desire to succeed in life. In Norse mythology, the chief god Odin, whose preferred domain was wisdom, relied on a pair of ravens named Huginn (Old Norse for ‘thought’) and Muninn (Old Norse for ‘memory’) to fly to the ends of the earth to obtain information for him. While some may associate this with shamanism, others believe that the ravens were depictions of Odin’s intellect, as his wisdom cam from being blind in one eye. Since Odin was also a god of battle and death, some believed that ravens were associated with him due to their predilection for carrion. Taken further, ravens were often seen as manifestations of Valkyries (goddesses who chose the valiant dead for military service in Valhalla), since both are attributed with a shape-shifting nature. While not a common symbol, many Norse began to use the raven as a symbol for their banners during sea travel and battle. Whether this should be attributed to Odin for the considerations of battle and death, or perhaps the Valkyries for their transformative properties in taking spirits to Valhalla, it is known that the Norse considered the Raven as a symbol associated with success and good fortune, be it in this life or the next. The Raven is a symbol that will always have two faces, and perhaps it is beneficial to recognize both elements that forever dominate its portrayal. Neither purely good or evil, the Raven symbolized military success, spiritual wellness and inevitable death on the battlefield for the Norse. It is a contrary spirit. In terms of negative depictions, the Raven represents evil spirits, war, destruction, death, the trickster and thief, doom and the void. But in many cultures the Raven is a portrayal of deep or natural magic, death and transformation, creation, the mystery of the unknown, healing, wisdom, protection and prophecy. To provide a small sample of the cultural background for some of these depictions, the Raven is the fatal touch of the Cailleach (In Scotland, known as Beira, the Queen of Winter), the wisdom of Odin, the vessel of prophecy given to a seer, the mighty protector of the Western Isles, and the healing message of an Indian shaman. As a result, the Raven is a complex birth in both nature and mythology, which is reflective of the personal complexity in human beings. While the Raven may never become a popular choice in terms of animal symbols, it embodies a rich tradition that spans the annals of history as a representation of culture. It is possible that the duality of the Raven could be representative of humanity’s dual nature, though we are perhaps reluctant to acknowledge this consideration at times. The Raven has often been taken for granted in history, and if given the opportunity, we can only imagine what its response would be. As members of Clan MacDougall, perhaps the most appropriate response would be that which will forever be linked to our symbol. Madge, Steve, and Hilary Burn. (1994). Jays and Magpies of the World. Published by Houghton Mifflin Company, Boston. Savage, Candace. (1995). Bird Brains. Published by Sierra Club Books, San Francisco. Terres, John K. (1995). The Audubon Society Encyclopedia of North American Birds. Published by Wing Books, New York.